Bundle up, grab a thermos of coffee and head outside to explore five trails around Augusta&apos;s River Region that are our favorites for leaf watching during the fall. This popular spot at the Augusta Canal Headgates is great for walkers or runners. You can also rent bicycles for a few hours of fun in the beautiful fall weather. Take the Jungle Nature Trail for a easy 3-mile boardwalk and dirt turf walk through wetlands, and mixed pine and hardwood forest. Along some stretches of this paved trail, a canopy of leaves creates a natural tunnel through beautiful hardwood . Other sections offer open spaces, glimpses of neighborhoods, wildlife and views of the Savannah River. Curving from the Lake Olmstead bulkhead through wooded areas between the Canal and Savannah River for 1.7 miles. Two bridges the trail offer great views of the river. The drive out to this series of mountain bike trails is just as beautiful as the trails themselves during the fall - especially in the afternoon light. This thickly forested area is part of Sumter National Forest and sometimes feels like you&apos;re in the mountains when some of the higher elevations provide panoramic views. Took Dexter on a hike on this beautiful fall day! Share your fall adventures with us! 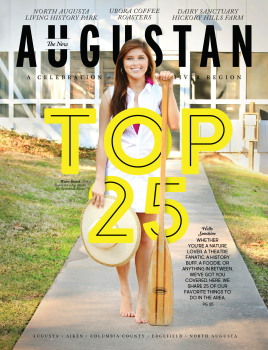 Use #LoveAugusta or #AugustasRiverRegion for the chance to be featured on our social media or website.